Spring is a busy time of year with a huge list of household chores to tackle after a long, cold winter. My to-do list is long, but I’m getting there. Along with these chores, I also have another very important item listed: bring my three cats to the vet for an annual check-up. We typically go in the the spring to make sure the cats are in good health. We adopted Reggie last March so this was our first time taking him to the vet. The Ontario Veterinary Medical Association (OVMA) commissioned a survey in 2014 about veterinary visits and it had some interesting findings. 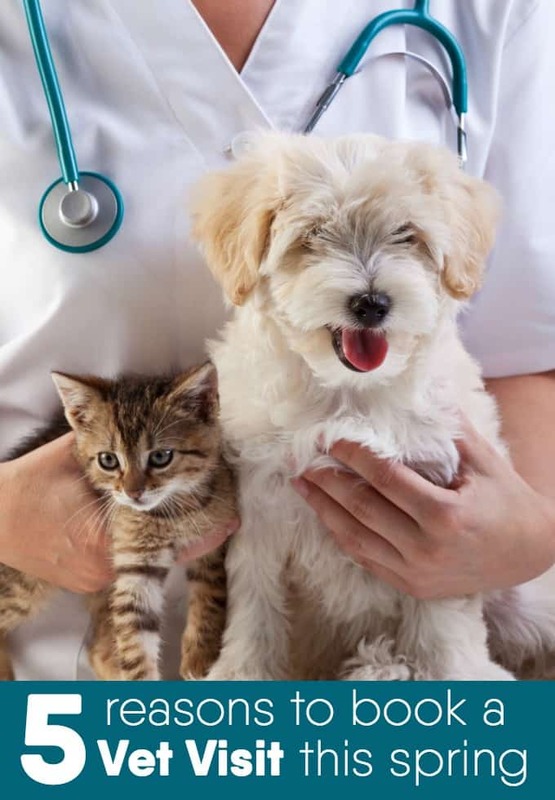 Two-thirds of pet parents say their last visit to the veterinarian was for an annual check-up or preventative care. Bridget and I went with Reggie last week for his annual check-up. I didn’t have any health concerns, but wanted to make sure he was doing ok. I’m a firm believer in preventative health care and think it’s important for pets to receive regular medical care just like we do as people. Today I wanted to share my top five reasons why you should book a vet visit for your pet this spring. This list was all items that I addressed with our vet when Reggie went in last week. Princess and Misty, my two female cats, will be next. 1. Check for fleas, worms, ticks and other parasites. Now that the weather is warmer, pets are at increased risk of exposure to parasites. My cats are 100% indoors, but we sometimes have dogs coming over to visit. Spring is peak flea season so it’s a good idea to get your pet checked just to be safe. When we first adopted Misty and took her in to see the vet, she had a tick on her head. The vet extracted it and it was a live bug! Even thinking back to that experience makes my spine shiver. 2. Early disease detection. If your vet discovers a new disease early enough, he or she may be able to stop it before it has a chance to progress. Misty had a vet visit a couple months ago for her teeth and we learned that she had stage one periodontal disease. It was caught early enough that we were able to adapt with some changes to her food and care to prevent it from getting any worse. 3. Weight management. Pets are usually weighed every visit. Reggie was “the perfect weight” and our vet said that she would like to see him stay at this weight for his lifetime. She said she normally sees pets gaining weight as the years go on. We will do our best to keep him active and eating healthy. On the other hand, Princess, has her appointment scheduled in less than two weeks and I’m nervous about what the vet will say about her weight. She’s a big girl and I’m hoping I can get some advice on how to get her to be more active. Obesity is a common nutritional disease in cats and dogs with almost one out of every three pets affected. Princess is one of them. 4. Up-to-date vaccinations. Your vet can advise you if your pet is due for any routine vaccinations. I brought in Reggie’s medical records from the SPCA and he needed two vaccinations. One of them was a rabies vaccination which our vet said was required by law in Ontario. 5. Ask questions. I suggest making a list before you go with your questions because it can be hectic when you get to the appointment. Ask the vet about any strange lumps, bumps or behaviour issues your pet may have. I asked about Reggie’s ears because he was scratching them and thought he might have ear mites. The vet looked and said they were just greasy and cleaned them out. She said some cats have more “ear wax” than usual. Lucky Reggie! What I love about our vet is that she is down-to-earth and you can tell she truly cares about my cats’ health and well-being. I never feel rushed and can freely ask questions and be given an insightful and easy to understand answer. 89% of pet parents say they are loyal to their current veterinarian and I know that I definitely am. It’s always a positive experience. Almost half of the people surveyed (47%) said they were recommended to their current veterinarian through friends, family or a co-worker. I asked my Facebook friends when we moved back to the area who they recommended. It proves word-of-mouth advertising is the best there is. If you don’t have a vet and you live in Ontario, find a veterinarian near you with this handy search tool. If cost is a deterrent to you bringing your pet in for a check-up, I encourage you to check out the Farley Foundation. It was established in 2002 by the OVMA to help out pet owners who aren’t able to afford necessary or emergency veterinary care for their pets. It’s worth taking a look at to see who qualifies and what kind of medical care is covered. I had no idea it even existed until recently! It’s definitely the kind of charity I would want to support. I encourage you to call your veterinarian and book an appointment for your pets for these reasons above or any other concerns you have. When was the last time your pet visited the vet? Connect with the OVMA on Facebook and Twitter. Yes, yes, yes! My dog just had his annual checkup last week with his vet and the timing was perfect because they found a parasite in his stool sample, so we ended up catching it early. Regular vet visits are so important. This is a great post. It’s so important to to get your dog checked out every year. If you have a senior dog, every 6 months is better. Excellent reminder to give your pet a regular checkup every spring! Right now we are without a pet, but when we did have one they got a check up each year and got updated on their vaccines. It is very important for your animal to go to the vet. Just like humans animals need their doctor too. I”m so glad you posted this. It’s hard to believe, but I know people who still don’t understand how important it is to get yearly checkups for their pets. I think it’s so much better to catch a health problem with your pet early, rather than wait until you have a bigger, more expensive (or even more life threatening) situation. Annual check ups are really important! It is so important to take care of our fluffy babies! Mine has an appointment coming up soon – fingers crossed that she is in tip top shape. These are some really good points. We have another visit in a couple of weeks. Our kitten needs her shots! Our cats go to the vet on a regular basis. They always go in to get their shots when needed. We recently had to pick up some flea stuff because the fleas were getting bad with them and nothing else was helping. It is so important to have regular checkups for your pets. We go in every six months for the cats to have a checkup. These are great reasons for taking your furbaby to the vet. Spring is a great time to get the flea and tick medicines started. Such a great reminder! Our dog is up for vaccinations this summer! Going to the vet is part of me booking everyone’s yearly appointments. When it comes to the family pet, it might be costly, but is part of animal ownership. We don’t have any pets, but this is a great reminder for those who do. This is a great reminder that our pets need check ups just as we do. It is important to keep our animals healthy and free from harm. My dog is up to date on all her shots, physical and dental. We spent close to $800 so I hope she is good to go until next year! I feel like I don’t know what I am doing with our first dog. Thanks for the tips.